Today I got a bunch of dolls repaired using hard plastic epoxy. 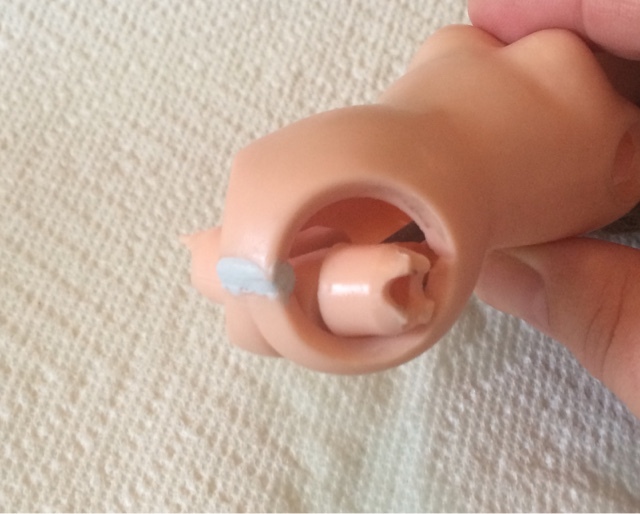 When a hard material doll has a split or is missing a finger, hard plastic epoxy is my go-to product. You can use epoxy to repair PVC plastic, hard plastic, resin, composition, and more. 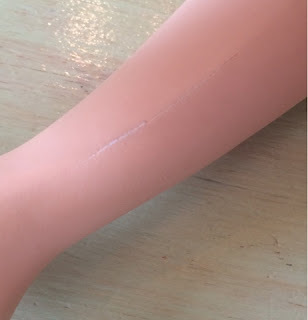 You can use it on vinyl as well, although it isn't ideal because the difference in texture between soft plastic and the hard epoxy makes the repair really noticeable. Today, besides using epoxy on the dolls, I tried it on a mirror insert made of Styrofoam with a plastic coating. You can find hard plastic epoxy in the painting section of the hardware store. There are several kinds. Some have two different vials which must be mixed like paint. I prefer the kind sold in putty-like sticks. Kwik Plastic is one brand you might see, but there are several different brands. I've heard of a type of epoxy called Milliput or something like that which is tintable so you don't have to paint it, but I've never seen it anywhere I've lived. I think I'd probably end up painting it anyway. 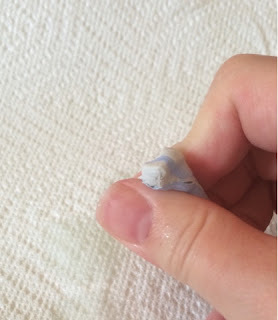 When you want to epoxy something make sure to have a disposable knife, paper towels, and water on hand. 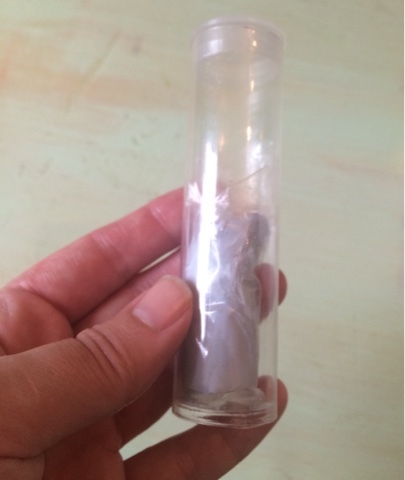 The epoxy will not stick to your fingers if they are damp. You don't want your hands dripping wet, but I find it helpful to dip my fingers in the water and dry them a little on the paper towel every couple minutes as I'm working. This makes the epoxy stick to the plastic and not to my hands. Cut off a piece of epoxy. To start your repair, cut off a piece of epoxy and knead it together to mix the two parts. When the epoxy is a uniform color it is ready to use. The epoxy dries fast, so try to only take as much as you will use in a short period, no more than 20 minutes. 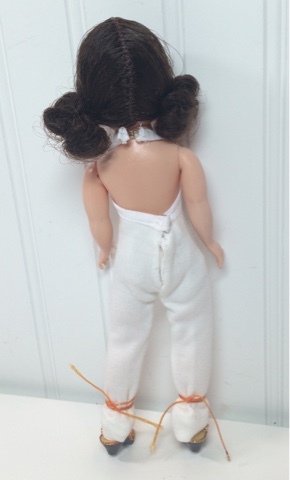 Make sure your doll has been cleaned and dried ahead of time when you want to do a repair. 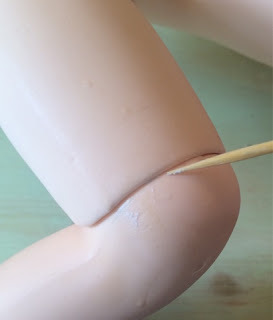 Apply the epoxy to the split in your doll and try to get the edges as smooth as possible while the epoxy is wet. You can sand it down later, but it's much easier to do as much as you can when you apply it so the repair is not visible. Besides split repairs, you can sculpt new parts for broken dolls using epoxy. 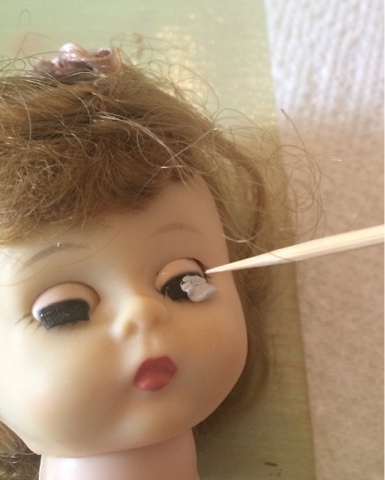 In this case I am making new hard eyelashes because a piece broke off this doll. 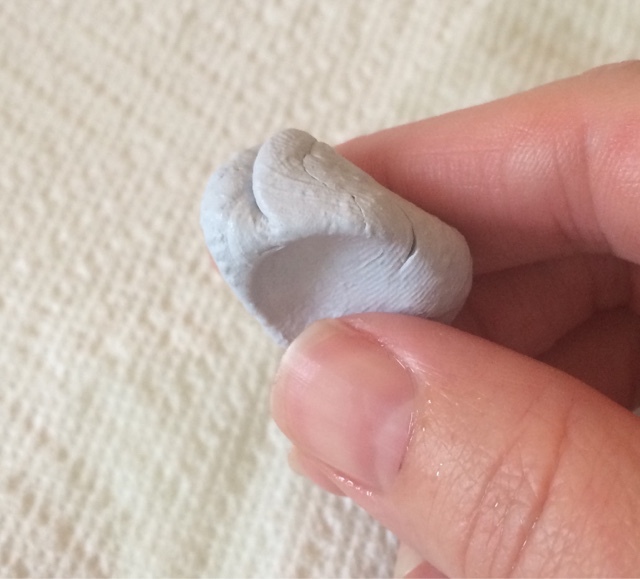 Apply your epoxy to the area and use a skewer or other sculpting tool to form it as you want, as if you were using modeling clay. Try to get the piece as finished as you want while you are sculpting; try not to rely too much on sanding to shape the piece. 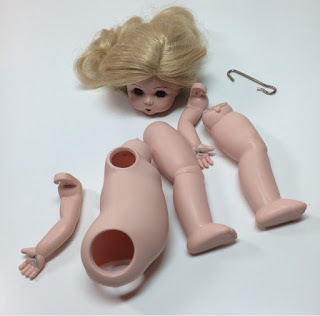 Sometimes a doll will have only a tiny split or factory flaw where the seams don't quite meet as they should. This is a really easy repair. Just take a tiny bit of epoxy and rub it into the split. Then clean the excess off the surface with a skewer or wet paper towel, leaving the epoxy in the seam only. This kind of repair is virtually undetectable when it is finished! 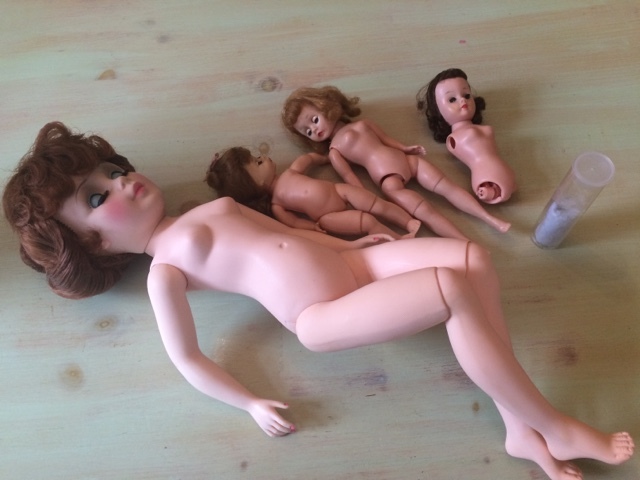 When your repairs are finished allow the dolls to sit without handling for at least two hours. If it's really humid or rainy the epoxy may take longer to dry. Today while mine were drying I repaired a mirror my mom gave me. My mom ordered several mirrors with an insert that makes the mirror look like a paned window. One arrived with the pane insert broken, so the company sent her a new one. 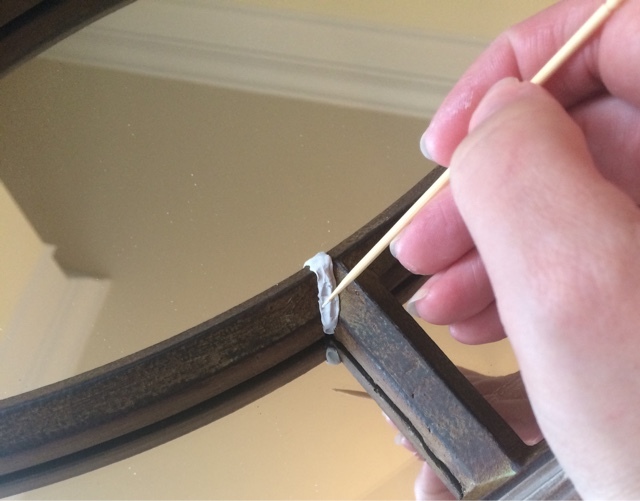 She gave me the broken mirror because I know how to fix things with epoxy. 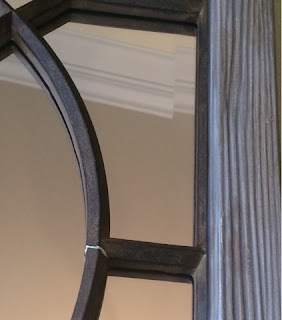 The mirror pane is Styrofoam with only a thin shell of resin over it, so I couldn't press too hard on it. I gently applied the epoxy and sculpted it to look like the rest of the piece with a skewer. When it dries I will paint it to camouflage the repair. I plan to hang this over the door to our living room. It's just the right size and will look like a transom window when it's finished. I think it will be really pretty! 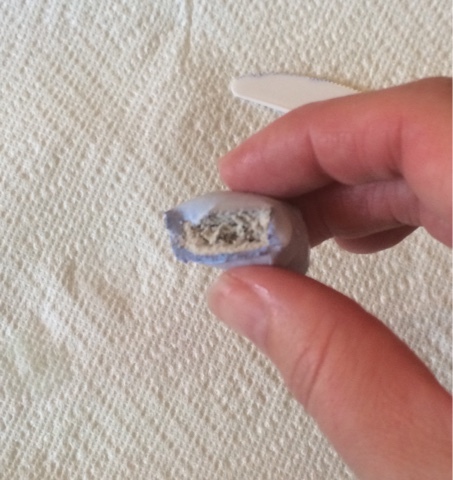 When the epoxy is dry it will turn from a light blue/gray color to white. Then it is ready for light sanding and painting. I use oil based paint for all the the tiniest repairs. The very small seam repair shown below will disappear with a light coat of acrylic paint dabbed over it with a makeup sponge. The dolls you see here are coming soon to my Atelier Mandaline stores on eBay and Etsy, so please check. This past Friday was the happiest I've ever been to own the Young Living Animal Scents collection. First thing Friday morning, well before dawn, we let the dogs outside and fed them. Then, while I was rushing to get the kids on the bus, I heard a sort of shriek. I thought it came from outside and wondered for a second if it was one of the dogs, but dismissed it, telling myself it must have been our bird. A few minutes later, however, our dogs were banging themselves into the door, clearly all upset. When we let them in we saw our Spitz had a big bloody welt on his back. I inspected it and didn't see any teeth marks, so I didn't think it was a bite, but I can't imagine what else it could be. By that time the sun was coming up so it was light enough to see. I walked around the yard looking for what might have happened but I couldn't find anything. I put the kids on the bus and then came in to see what I could do for the Spitz. 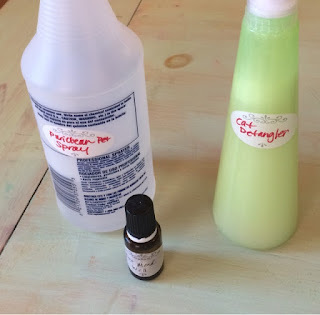 Our kitten was spayed last month and I had mixed up some PuriClean wash and a MendWell and InfectAway roll-on to care for her incision. I still had a lot left, so I was able to quickly clean the wound. Then I applied the roll-on to help boost healing. Two hours later, other than the oily patch of hair, there was no sign of the welt. The dog has been fine ever since. I was so glad I had the oils on had and that I had some pre-mixed for emergencies! Little did I know, I would be even happier about it as the weekend progressed. On Friday night our neighbor who works in animal rescue posted a plea for help because she said a litter of Himalayan kittens had been abandoned and needed homes immediately. 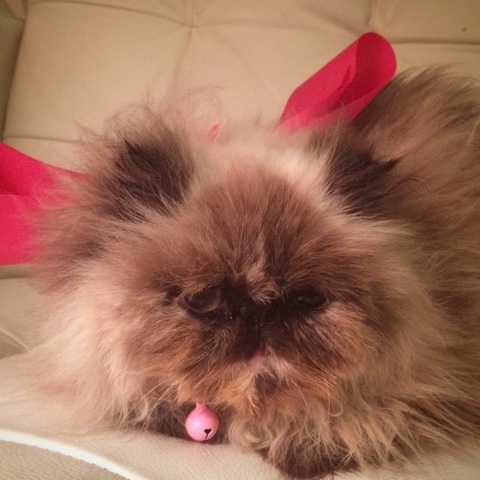 When I was a teenager we had a Himalayan cat who had kittens. My husband took one of the kittens. 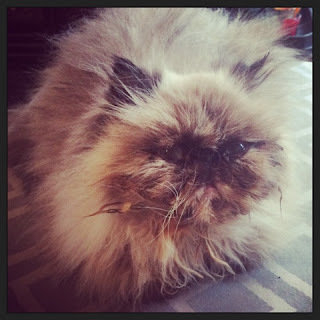 Since we both had Himalayans, and they were very sweet cats, so we both have a soft spot for them. So even though we hadn't been thinking of getting another cat we called and asked to see the cats. Saturday morning we got up and went to the Humane Society and found out it wasn't a litter of kittens abandoned, but 12 former show cats. A woman bred these cats and showed them, but then she died and her husband stopped taking care of them. It looks like he just put them in a pen outside for a while. Finally he took them all and surrendered them to Animal Control. These are older cats, so if they hadn't been purebreds they would probably have been put down, but since they are obviously valuable, Animal Control asked if the Humane Society would take them. When we saw the cats, I have to admit I quailed at the thought of taking one. They were all sick with coughs and running eyes and noses and they were absolutely filthy. These are cats with long, long hair, and nearly all of them were caked with red clay and feces. Their coats were horribly matted, too, almost felted in fact. I just couldn't stand the thought of leaving these formerly pampered cats there without at least helping one, though. It was as if a bunch of princesses had been dumped on the street! We chose the friendliest one, who ranked just about in the middle of the pride in terms of filthiness, and who was the only one to have already been spayed. Since we took one before they were groomed they gave us a deal on the adoption fee. We figured we would have to hire a professional groomer. 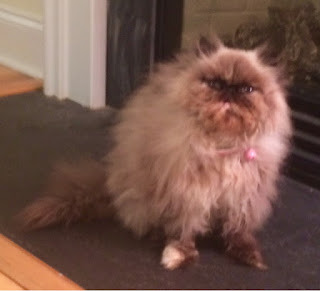 We brought her home and told our teenager we got him a tribble, since she's just a ball of fur. Our youngest looked at her and asked, "What is it?". Since we already have the kitten named Oreo, the kids named this one Snickers. Saturday night, however, I started petting Snickers and brushing her and found she loves to be brushed. Now that I have observed her more, I think the only time she ever was held was during grooming. She was clearly groomed a bunch; she's a pro at it! I decided to try to clean her up myself and figured I could call a groomer if it was too much of a challenge for me. Since I grew up with a Himalayan and we have a Sheltie and a Spitz, extremely fluffy dogs, I do have a lot of experience with long haired animals. I made cleaning wipes by spraying my PuriClean spray on paper towels an wiping her down with those. The PuriClean spray is about 2 cups of water, 1/2 cup of witch hazel, and 3 drops of PuriClean essential oil. It's super-diluted and gentle since I made it initially for a kitten, so I even used it on Snickers' face. Snickers tolerated that well, so I made up a de-tangling spray for her matted coat. This was half a can of coconut milk, 1/4 cup of witch hazel, about 1.5 cups of water, and three drops of PuriClean. I shake this up and spray it on the brush or the fur before brushing. It's a leave-in and cleans and conditions at the same time. I sprayed this all over Snickers' back and brushed her out. On Sunday I decided to try to give Snickers a "sanitary clip". This is where you shave the bottom, tummy, and insides of the legs to keep the animal clean or to clean up a dirty animal. Snickers needed this badly, and also had to be shaved all under her chin and neck, where dirt and food had congealed in her fur and matted it irreparably. She could barely walk because she had huge mats on the soles of all her feet, so these had to be shaved as well. My husband I took turns shaving her and we gave her lots of treats and breaks in between sessions, and she tolerated it quite well. When we were finished removing the mats my son and I washed her, mostly on her underside, in the sink with pet shampoo (not homemade). Then we gave her a blow dry with the hair dryer. Now that we can see her face, we see Snickers is a lovely girl. She still has a couple small mats here and there, but we are working on those slowly. Her cold is improving. I am applying a mixture of 3 drops each MendWell and InfectAway diluted in flaxseed oil (the same roll-on I used on the kitten and dog) between her shoulder blades twice daily to help her fight off the bug. Since she's a "plated-face" or "peeked face" cat she's prone to congestion and runny eyes, so I wash her face with a PuriClean wipe daily. I am actually thrilled we adopted this cat. In fact, now I wish we'd taken more than one. If I'd known we wouldn't have to pay for grooming I would have! Snickers is one of the most affectionate cats I've ever known. She would like to just be cuddled all day. It's like having a living teddy bear, and she acts just like you imagine a teddy bear would if it were alive. She just snuggles and cuddles and purrs and purrs. 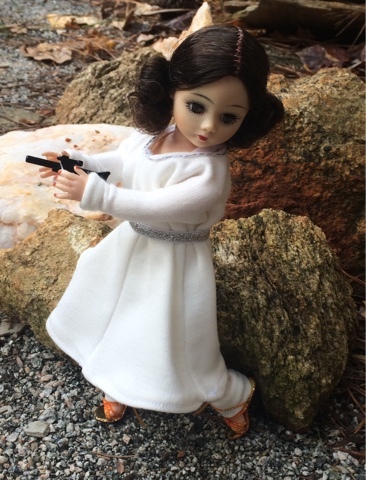 She looks, in fact, just like the Princess Kneesa ewok plush I owned as a girl, except she's real! It's really nice because now we have a playful kitten (who rarely lets us hold her) and a lap cat. The kitten is not happy at all to have another cat in the house, but she seems to be coming around. We hope they'll eventually be friends. I doubt Snickers ever got to play much as a kitten. Sometimes she will look at a cat toy and kind of lift her paw, but it's like she doesn't know what to do. I also doubt she ever got much affection; I think that's why she came to enjoy being groomed so much. It's a good thing, because a fur ball like this needs a good brushing every single day! 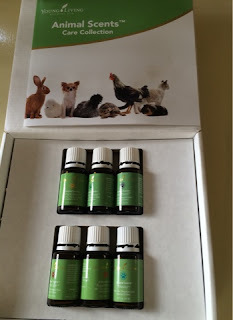 You can buy the Animal Scents collection from Young Living or sign up as a member and get it at the wholesale price on my Web site. Now that I have this collection I can't imagine owning pets without it! There will be nine more of these cats available soon from the Humane Society of Iredell County, NC, so please contact them if you are interested in providing one with a loving home. 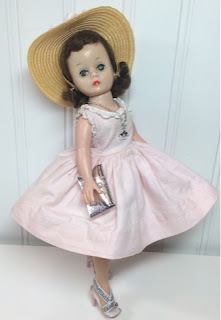 Those of you who read my Cissette Southern Belle post might recognize this extremely rare Cissette doll. I was able to acquire two of these dolls by purchasing both of them from one collector. Unfortunately, she had undressed the dolls and lost much of their clothing. By taking both dolls I was able to piece together enough of the outfit for one doll. I sold that one as the Southern Belle doll. After that, though, I was left with one dress, which I will list for sale soon, and one doll with buns on the side of her head. Hmmm... well, just look at her. 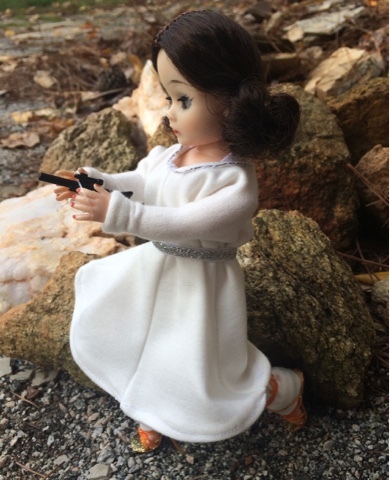 You know she had to be Princess Leia! Technically, since this doll was made before the Star Wars movies, maybe Leia was channeling Cissette and not the other way around! You have to admire Princess Leia. She's exiled from her planet. She has to hide and spy and fight and shoot but still finds time to style her hair in her elaborate hairdo and keep it looking nice. And she keeps her white clothes clean throughout. I can't keep a white shirt clean for an hour! My princess wears high heels too, a necessity since the doll has high heel feet. They are kind of big on her but when she's standing they stay on OK. 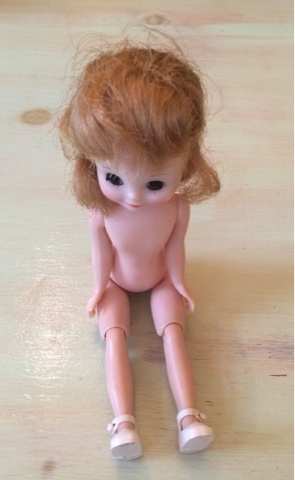 The doll has green eyes. I restrung Cissette and designed a costume for her. I purposefully didn't look at the movie dress until after I cut it out. I wanted it similar but not identical. I was mainly trying to just remember the movies, which I haven't seen since I was a kid, at least not all the way through. I made a Ponte knit jumpsuit with a tunic over it. The tunic is A-line but can be belted with the metallic elastic belt. I added some silver thread to the neckline. Then I dug through the kids' Lego tub to find a tiny gun. I knew I'd find one; they've been clogging up my vacuum cleaner for years! The kids were trying to tell me they didn't see any. Please. I found three within about two minutes. When I was finished I took Leia outside and had a fabulous time with her photo shoot! She poses very well. The Star Wars movies made such a big impression on me I can still remember going to see the first one, and I was only three years old! My aunt and uncle took me to a movie theatre in a different Ohio town than ours (I imagine our tiny theatre was full). This theatre might have once been an opera house or vaudeville theatre maybe. Or maybe it was just a movie palace from the golden age of film. It had art deco murals and friezes everywhere and a sweeping curved staircase carpeted in red velvet. There was a stage in front of the screen. The theatre was so amazing I didn't know where to look, and the movie hadn't even started yet! The sad thing is it was falling apart, and even I thought it was a terrible shame to let such an incredible building get so run down. I don't remember it at all later on in my childhood so it probably got torn down. After the movie I remember every time I closed my eyes I could see stars rushing by inside my eyelids, like the film had burned them into my retinas. I guess I fell asleep, because the next thing I remember is my aunt opening the car door and we were in my grandparents' driveway. I have Leia and many other dolls for sale in my Atelier Mandaline stores on eBay and Etsy. Some I have listed in both stores, but I have only one. This time of year I want to have the highest possible exposure. I decided if two people try to buy it at once it will go to the first person who pays. It's not ideal, but until I can get more of a reputation on Etsy I can't get the traffic I need. 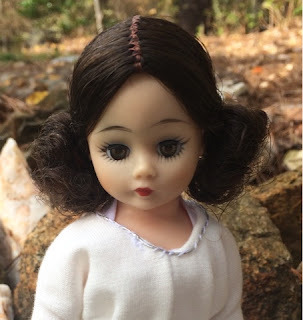 I was approached last week by a person who wants to sell my dolls in Japan, and if that works out it will be a real coupe for spreading my brand! Fingers crossed! The other day I was refilling my bottles of face oils for day and night. I wrote up a recipe for these last year, but back then I hardly had any oils. Now that my collection has grown more extensive I thought I'd let you in on what I'm using now. Over the summer a friend's daughter, who's about 8 years old, asked who was older, me or my 16 year old son! I was feeling pretty confident after that! There is, of course, no high without a low...the other day one of my youngest son's classmates, on seeing a photo of me from about 5 years ago exclaimed, "Is that you? You look so young!" If you want the truth, ask a 6 year old! I do think I look pretty good for my age now that I added the oils to my regimen. I was getting crepey looking eyelids and a large age spot was lurking just below the surface of my forehead. Both those issues have disappeared. I also had some tiny bumps, not pimples, but just little hard bumps next to my eyebrow and those are gone now as well. I realized after I took the photo above that I left Purification out of the picture. Although it isn't shown I do use that in my day oil. The roller ball on the bottle really makes the product last a long time; I get about 6 months of use from a 15ml bottle of oil! Mix 15 drops Tea Tree essential oil, 10 drops each Carrot Seed, Cypress, Patchouli, and Sacred Frankincense essential oils, 20 drops each Purification, Frankincense, Myrrh, and Geranium essential oils in a 15ml bottle. Top off with grape seed oil and a Young Living Aroma Glide roller fitment. Apply to the entire face each morning, using care around the eyes to keep the oils out of the eyes. To blend the oils I roll the bottle between my palms for several seconds so the heat from my hands can help them meld together. 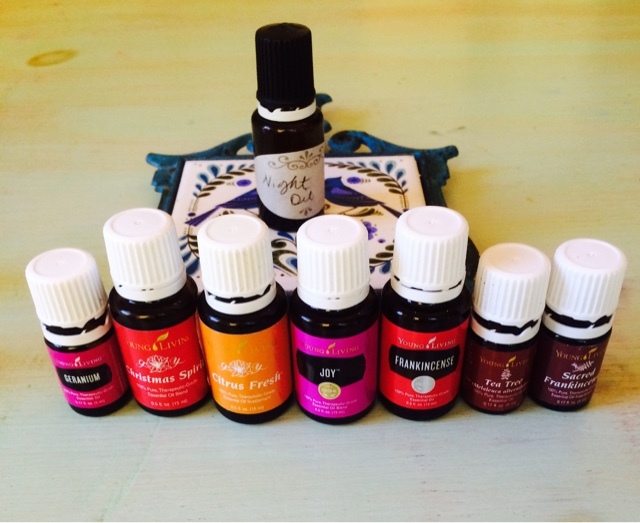 I have a reason, of course, for using each oil, specific to me. 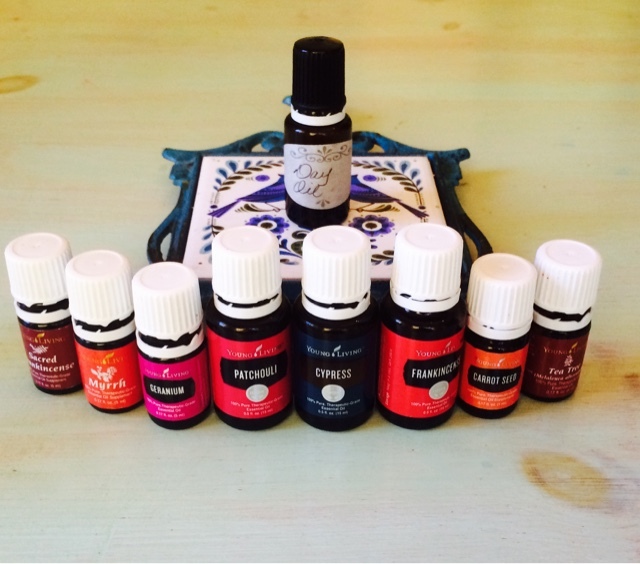 That's the wonderful thing about essential oils: they make it easy and affordable to customize all natural products for yourself. Tea Tree oil combats the blemishes I still sometimes get, as does the lemongrass in Purification. Purification also helps with broken veins and uneven skin tone. Sacred Frankincense has been shown in studies to have cell regenerating properties and Frankincense is great for general skin health. According to Dr. Axe, Baylor University in Dallas, TX recently published results of their study showing Frankincense is more effective in killing cancer cells than chemotherapy. Sacred Frankincense is also supposed to kill cancer cells, but I'm not sure if it was used in that study. 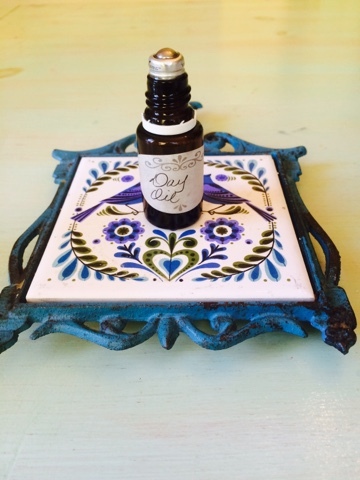 Geranium is another wonderful oil for general skin health. 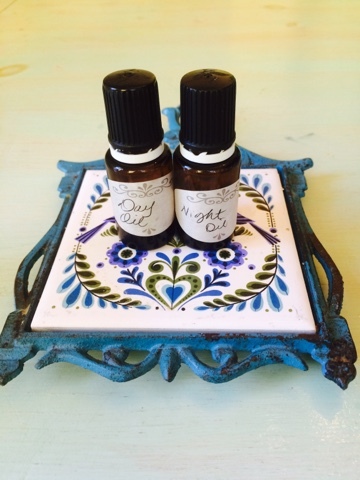 Cypress and Patchouli tighten sagging skin, and Myrrh and Carrot Seed have sun screening properties. My night oil contains a lot of citrus oils because the acids in these fruits exfoliate the skin by gently eating away the old top layer of dead cells. Using them is like having a very diluted chemical peel to resurface the skin every night. These oils will make your skin very photosensitive, however, so you should not wear them in the sun because you would burn quickly. I didn't know this many years ago and went for a walk wearing a face cream made with citrus oils and got a burn like a cigarette burn on my face from the sun, so it's no joke! 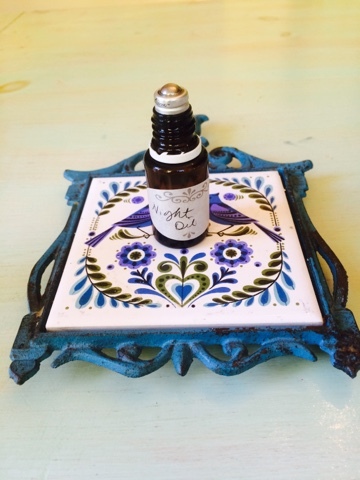 I have very sensitive skin and every once in a while this oil will make my skin sting. If that happens I just dilute it by rubbing olive oil or grapeseed oil all over my face. Mix 20 drops each Citrus Fresh, Sacred Frankincense, Frankincense, and Joy essential oils, 10 drops each Christmas Spirit, Tea Tree, and Geranium essential oils in a 15 ml bottle. Top off with grapeseed oil and a Young Living Aroma Glide roller ball. Apply all over face each night, being careful to keep out of the eyes. The cinnamon bark oil in the Christmas Spirit blend helps tighten the skin, and that mixture also contains orange oil to improve tone and texture. You could just substitute those oils if you don't have the Christmas Spirit. The blends I mention, such as Christmas Spirit, Purification, and Joy, are all exclusive Young Living blends. Young Living is the brand I recommend because you can become a member and purchase the oils wholesale and I believe they are the highest quality oils sold here in the US. Another wonderful way to improve the health of your skin and your health in general is to eat more fish. I try to serve fish at least once a week. This has never been a problem until last year, when my youngest suddenly began to ask, "Is this fish?" and if so, to refuse to eat it. I don't understand it; when I was little tuna melts, salmon loaf, and fish sticks were among my favorites and those suppers were meals I always looked forward to. None of my kids are great tuna melt eaters, however, and my husband put the kibosh on salmon loaf almost immediately after our marriage. 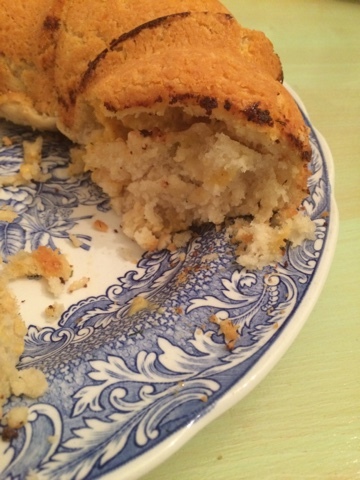 So, the other night I was browsing Pinterest for ideas and came across a pizza stuffed monkey bread consisting of Grands biscuits stuffed with chopped onions, peppers, tomato sauce, mozzarella cheese and baked in a Bundt pan. I thought, why not tuna melt bread? It's an easy bread to make. I, of course, do not use canned biscuits as my homemade biscuits are fabulous and don't take any longer than opening the biscuit can and separating the dough! Plus, my recipe is only three simple and wholesome ingredients. To make the tuna, mix the drained canned tuna with the ranch dressing, Colby cheese, and pickle relish and set aside. To make the biscuits, sift the flour into a large mixing bowl and make a well in the center, pushing most of the flour up on the sides of the bowl. Squeeze the butter into little pieces in the center of the well. Use the butter wrapper to grease the Bundt pan. Pour the milk into the well and stir with your hand, causing the flour to fall down into the well. A dough will form. 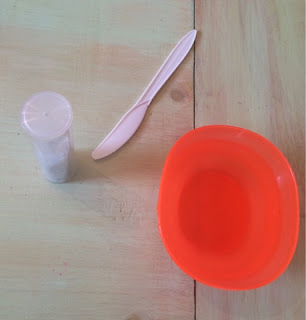 When the dough has formed but is still very liquid, begin turning the bowl clockwise, pulling a tiny bit of flour into the dough with each turn and kneading it in. When the dough is stiff enough to hold together knead it a couple times, turning it over and then back again to coat both sides with flour. Knead in this manner until the dough is stiff enough that you can pull off golf ball sized bits of dough. You might have some flour left over; just leave it in the bowl. Pull off 12 bits of dough and roll each into a ball. This should use up all the dough. To assemble the bread, flatten each ball of dough into a disk. Place a tablespoon or so of the tuna mixture in one side of the disk. Fold the other side of the disk over and pinch closed. 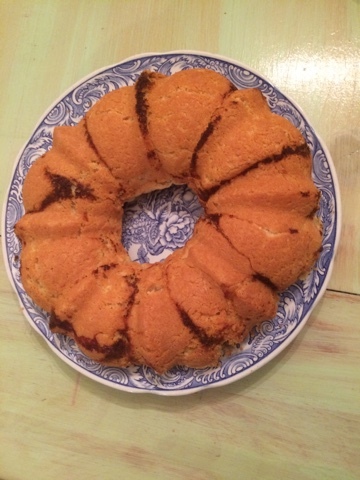 Place the filled dough seam side up in the Bundt pan. Repeat, placing each filled dough ball next to the previous one until the pan is filled and your dough is used up. You will probably have some extra tuna mixture left over. To make the glaze, melt the butter and mix in the dill and lemon peel. Pour the glaze evenly over the assembled bread dough. Bake the bread at 350 degrees for 30 minutes or until the bread is golden and puffed up. Turn the bread out onto a serving platter and serve warm with the extra tuna mixture on the side. This recipe was a huge hit. Every kid gobbled it up and asked for seconds. So, mission accomplished! They got their fish in at least one night last week! I get so many questions about re-stringing dolls I decided from now on whenever I string a different type of doll I will show photos and write a tutorial. This goes along with re-stringing kits you can buy from my eBay and Etsy stores. 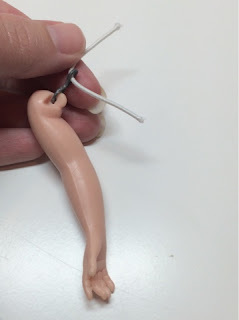 My last tutorial showed one method for stringing a Wendy-kins 8 inch doll. 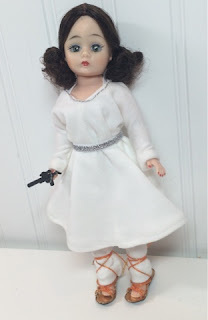 This post will show an alternate method as well as show instructions for stringing walker dolls. 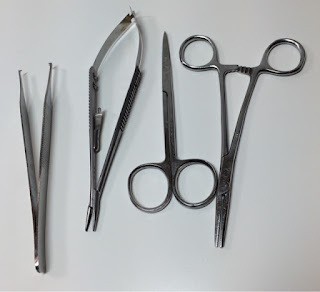 Besides elastic and hooks, which you can purchase from me, you find other tools, such as tweezers, pliers, small scissors, and a hemostat handy. You will also want to repair any splits with epoxy prior to stringing. 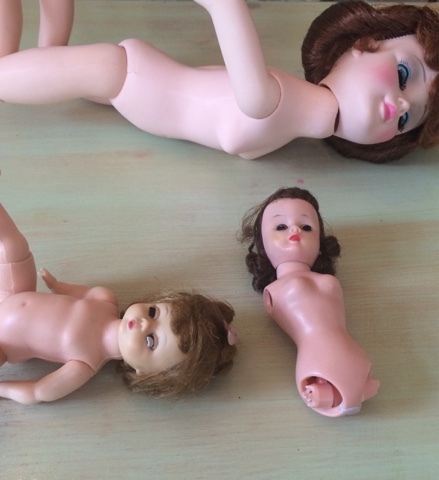 Some dolls, such as Tiny Betsy McCall and Muffie Walker have strung arms but not legs. If their legs are broken you will need to repair them with epoxy. My posts show those repairs here. Now, vintage Cissette is considered a "walker" doll, although she's not the head-turning walker people usually think of. Instead of her head being affixed to a pole inside her body, hers is strung to the pole. So the best these ever do in terms of "walking" is to bob their heads a little when you move the legs. The stringing method I will show you is the same for either type of walker, however. 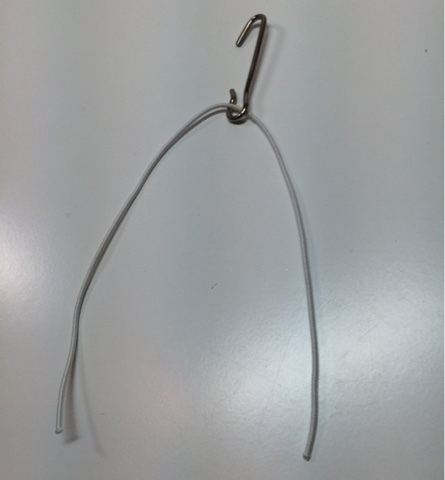 Begin your stringing by making sure there is a hook attached to the arm. If the original is lost you can buy a replacement or make one from wire that is bendable but which holds its shape when stressed. 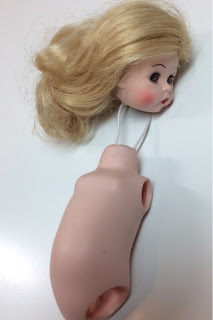 You will make the hook into the shape of an S. Thread a piece of elastic through the hook and pull it through the doll's body, going behind the interior pole, to the other side and pull both ends out the arm hole on the other side. Pull the elastic through the other arm hole. Now thread the other arm hook onto the elastic and pull the elastic as tight as you can get it. Knot the elastic and move the knot to the center of the body so it's not on the hooks if possible. Add the other arm to the elastic. Now you're going to do the exact same thing to the doll's hips, except you will thread the cord through the walker mechanism, which is shown below. When you pull the elastic through the hips you need to draw it through the center of the walker mechanism and the body and then the walker mechanism on the other side. Bring the elastic through the walker mechanism. Once the elastic is through the body and both walker circles, hook the second leg hook and pull as tight as you can again. It's really challenging to get these tiny pieces of elastic tight enough to work, so pull hard. Then tie off the cord just like you did with the arms. Add the second leg hook and tie off. A traditional walker doll's head will be attached to the body pole at the top, so you won't have to worry about it unless it's come off. If it has you might see a hole in the top of the head. 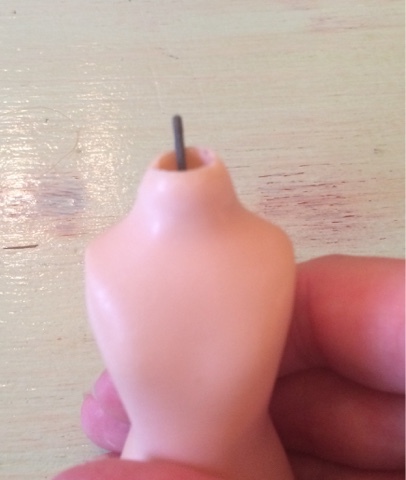 Those types of dolls have metal prongs at the top of the walker pole which go up through the holes in the head and fold over one another so it looks like a metal staple. On that type of doll you would have to remove the wig to affix the head. It's rare for that type of head to come loose, however. 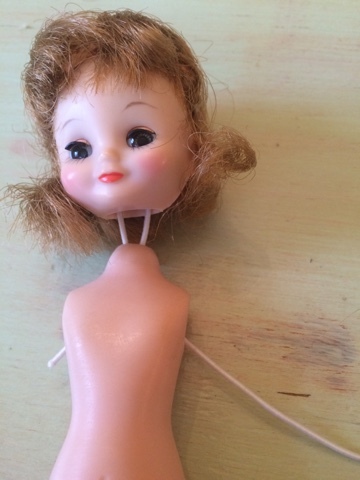 It's far more common for this type of doll, whose head is strung to the walker, to come loose. To string it you draw the elastic over the head bar inside the head, making sure to avoid the eye mechanism, and then string it to the body hook as shown below. String the head as shown. When you've finished your stringing, pose your doll a couple different ways to make sure the strings are tight enough. This one was good, so I cleaned her up and styled her hair and she turned out well. She's for sale in my Atelier Mandaline stores as well. The second type of doll I'm stringing today is the simplest type. 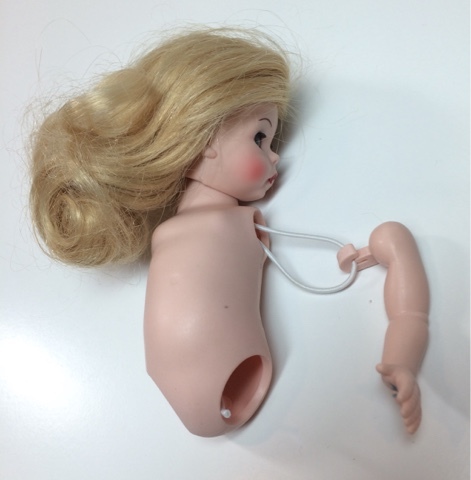 This kind of doll is strung in a loop, with the head, arms, and legs all attached to the same piece of elastic. This generally works better for dolls 10 inches or larger. 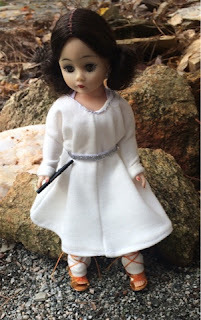 I am demonstrating on an 8 inch doll, but please keep in mind I prefer to string these small dolls using the method shown in my Wendy Restrung post because it allows for more movement of the arms. In this case I am stringing my model doll whose hands were colored on with blue marker. I can't really resell her, so I just use her to display clothing and she doesn't need to pose all that well. To begin this type of stringing, start by threading the cord through the head hook. It is the longest hook. Then affix the hook to the bar inside the head, again avoiding the eyes. Now draw the elastic through the neck into the body cavity. Hook one arm hook to the cord and then draw the same side of the cord down to the leg hole. Repeat on the other side. Bring the cord through the leg holes as shown. Now hook one leg to the cord and then draw that same piece of cord through the body and hook the other leg to that cord. Hook one leg and then hook the other to the same cord. Once both legs are hooked, pull the elastic as tight as possible and tie the two ends of the cord together. Move the knot so it's not right on any of the hooks. 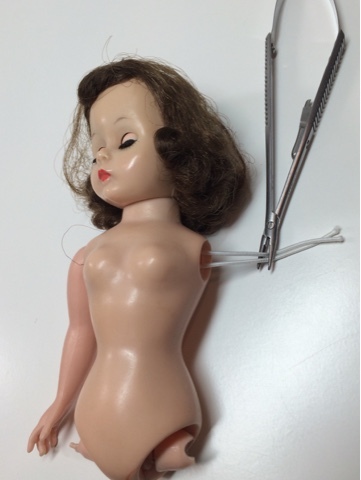 Now test your doll again to make sure the stringing is tight and you're all ready to dress her! 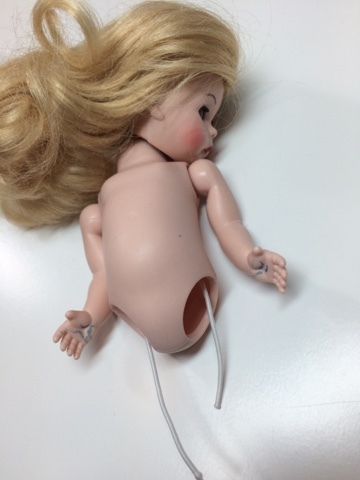 When you use the elastic cord your doll will last a long time before needing new stringing. Again, please visit Atelier Mandaline on eBay and Etsy for stringing kits and the dolls shown in this post. 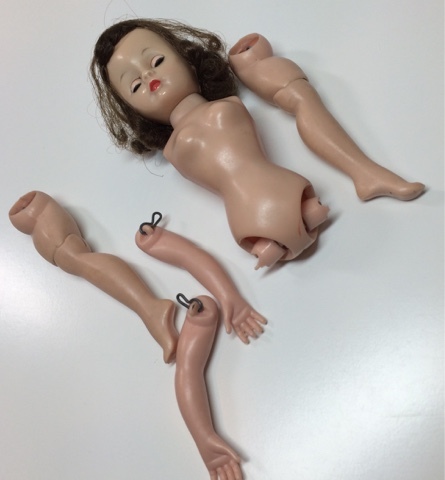 Some dolls will have jointed arms or legs so they will only need to have the other limbs strung to the head. 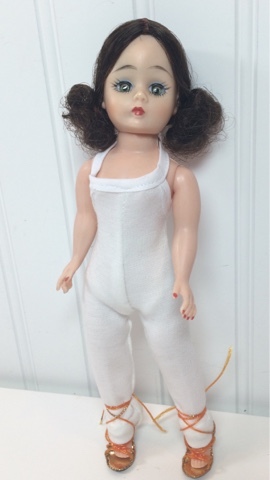 The Jacqueline face 21 inch doll (or the straight arm Cissy) is an example of this. Notice I use thicker cord for larger dolls. 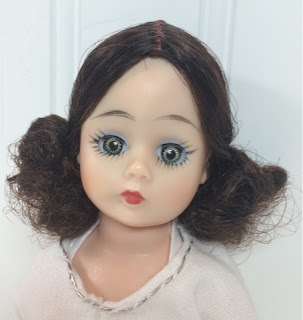 I sell kits to restring different sizes of dolls in my shops on Etsy and eBay. Begin by cutting the cord about twice the length of the doll from the neck to the hip. Draw the cord through the head hook and bring it down into the body through the neck. Hook the head to the elastic. Hook one leg to the cord and then hook the other leg. Draw the cord tight and knot it. Hook the legs to the cord. 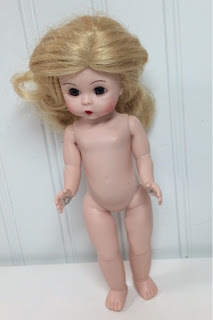 This particular body type is prone to seam splits in the hips and torso, so I don't string it as tight as other dolls. I make sure the doll can hold a pose but keep it as loose as possible. 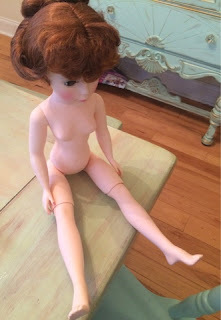 Recently I had a question about re-stringing the knees on the type of doll shown above. 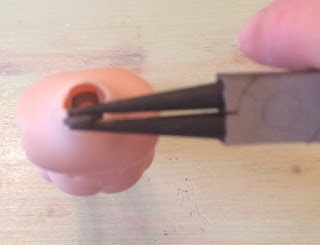 This method will work on Cissy, Jacqueline, bent knee Alexander-Kins, and most bent knee walker dolls. 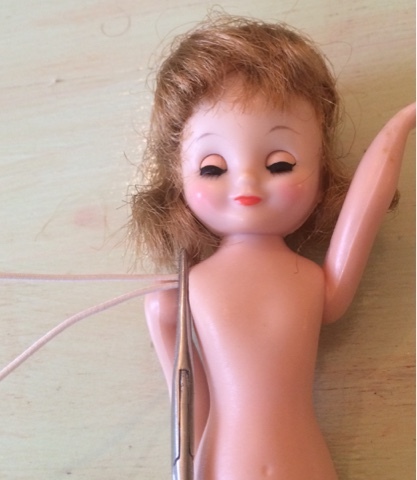 It is similar to the way ball jointed dolls are strung. 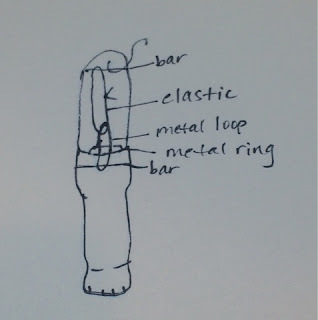 I strung a Wendy-Kins' knee recently but couldn't get good photos, so I drew a diagram (see below) of how the string should go. It is hard to get the string through the small ring inside the knee but if you are patient you can do it. Pulling with pliers helps. 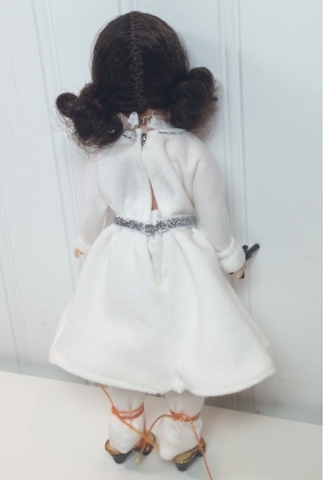 Bent knee dolls, both walkers and non-walkers usually have the same type of knees and this repair will work for both. You will see the lower part of the leg has a metal loop sticking out of the top of the knee. 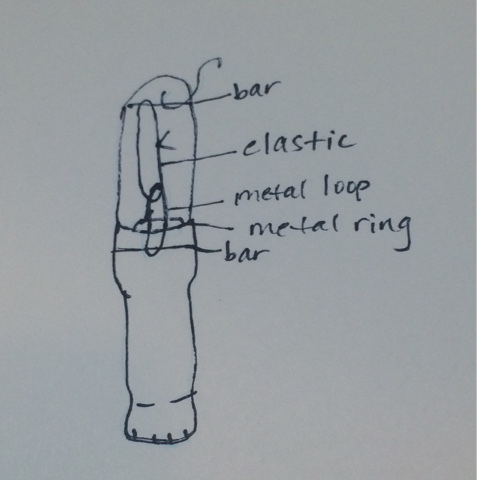 Fit this loop through the metal ring inside the thigh. Usually a spring hooks the metal loop in the knee to the leg bar in the hip socket. If the spring is missing, bring elastic cord through the top of the loop, bring it over the bar in the hip, pull tight, and knot. Move the knot away from the bar and loop to allow more movement in the knee. See the diagram below for a pictorial depiction. Tiny Betsy McCall by American Character is another doll with a special technique for stringing. In the factory her arms and head were strung in the same manner as the Cissette above. 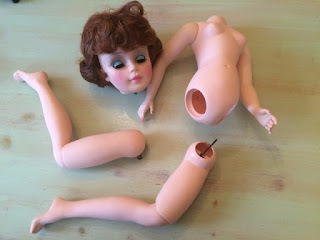 Her legs have plastic joints. However, I find it's almost impossible to get the arms or head tight enough stringing them in the original manner. 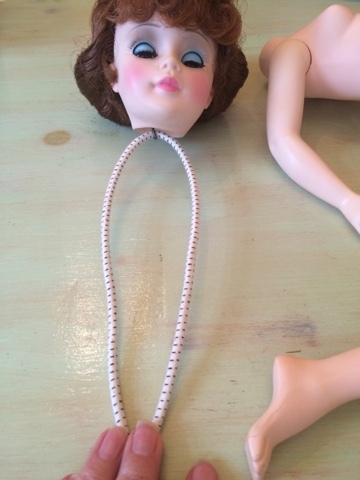 I like to remove Betsy's head hook and string her arms to her head. 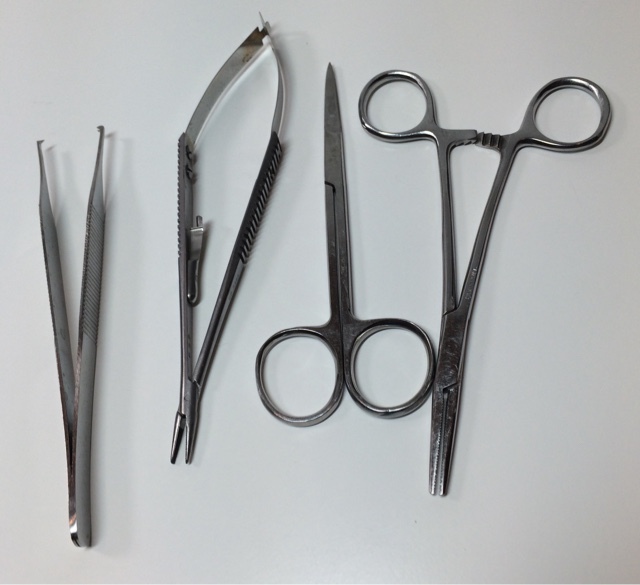 The head hook is inserted in a metal frame inside the body, and to remove it you have to squeeze it together tight enough to fit through the hole. I use pliers for that. Squeeze the hook to fit through the hole. When you squeeze the hook small enough you can drop it through the hole into the body and remove it through one of the arm holes. I save the hook for later use in a different doll. Now attach the cord to the head by threading it over the bar inside the head, just as shown in the Cissette above. Then draw the cord through the neck into the body. Bring the cord from the head through the neck. 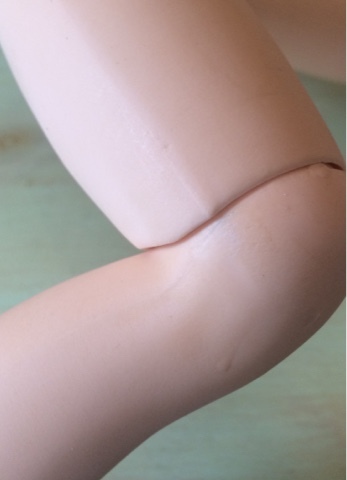 Hook the arms to the elastic one at a time, just as shown on the previous dolls, pull tight, and knot. This method allows Betsy to be tight enough to have the ability to really pose well and to hold those poses. In her original state she's kind of a floppy doll, so this method helps a lot! I get a lot of questions about stringing ball jointed dolls, Dollikin dolls, and the modern jointed-waist Cissy dolls, so I wrote a completely separate tutorial showing how to restring a Uneeda Dollikin. 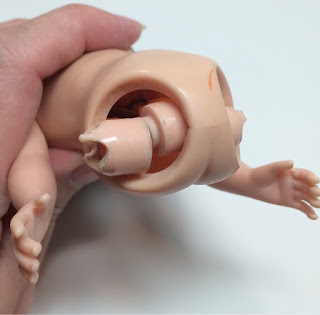 Many of the steps shown for Dollikin will work for other multi-jointed dolls. 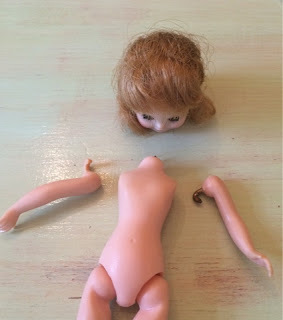 I also wrote a separate tutorial showing how to re-string American Girl dolls. You may purchase kits to restring all the dolls shown here as well as Dollikin and American Girl dolls in my Etsy and eBay shops.